This 7.62x51mm ammo was produced at the legendary Lake City Army Ammunition Plant. This 7.62 NATO ammo is loaded to the M80 NATO designation and is produced on the same production lines used to supply the US military. As a result, this ammo isn't polished like traditional commercially available ammunition, and the discoloration from the annealing process provides proof that ammunition was manufactured properly. 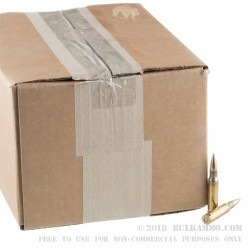 This ammo is loose-packed in a bulk 500 round box. Each 149 grain FMJ projectile is loaded into a boxer-primed brass case and is reloadable. This ammo will attract a magnet, so make sure to check out your range rules before buying. This overrun ammo from Lake City is some of the best on the market, so make sure to buy some in bulk while it is available! I'm not sure what some of you people are expecting when buying this ammo. Apparently, you've never handled military grade ammunition. This is 7.62x51 ammo straight from the box. Not that pretty .380 Winchester stuff you tweak your $7000 guns with that shoot themselves. This is man's ammo! I had one bad round in the box that missed quality control, but that's okay. I took it apart and weight it out. 44.5 grains which makes it equivalent to 4895. That's a good weight to run through my SOCOM. With that, shots down range average out at 2675 FPS. That's good news for a 149gr bullet. I ordered and received 1000 rounds of this ammo in December of 2018. A: This ammo will work very well in that SCAR. 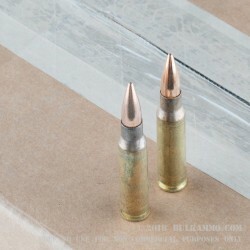 These cartridges are the very same that the mil-spec issued version runs. Q: Can you shoot a 7.62 In a 308 AR 10? A: Yes. Through a semi-automatic rifle this is fine. One consideration though. Since the 7.62x51 operates at a slightly lower pressure, some rifles do not cycle when using the 7.62 round. This is by no means common, but does occur often enough to mention. Q: Can l use your ammo in a Springfield M14? A: These M80 149 gr FMJ rounds are loaded to milspec 7.62x51 specifications and should be safe to fire in any rifle chambered in the same caliber. 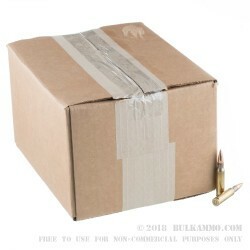 A: Hi There, This ammo is loaded to the M80 NATO designation and is produced on the same production lines used to supply the US military .Each 149 grain FMJ projectile is lead core with a bi-metal jacket and loaded into a boxer-primed brass case. This ammo will attract a magnet, so make sure to check out your range rules before buying. Q: Since this isn’t a steel tipped bullet, and most of the components used are like the smaller M193 round (copper, brass, nonferrous materials, except parts of the primer), what exactly is supseptable (or draws) this round to a magnet as it mentions in the description? Just curious. Still plan to buy some as they are a good deal. 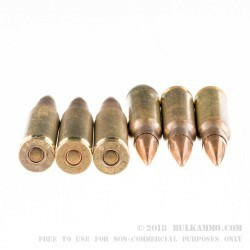 A: The bullet used in this ammo has a bi metal jacket that is made with several very thin layers of copper and steel sandwiched together and then wrapped around the lead core.